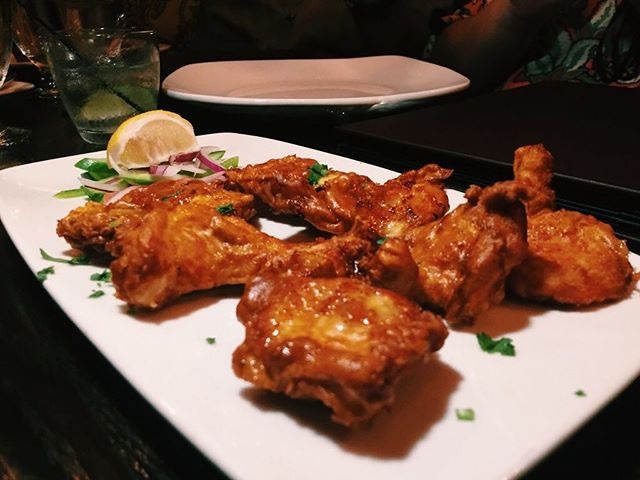 To paraphrase the late Mr. Rogers…”It’s another great day in the neighborhood.” That’s because we now have another great restaurant within walking distance of our house. Of course, being a Southern California native, I have driven there each time I’ve visited for the past four years. Following up on a stupendous lunch experience with my buddy Ed at the Mint Leaf, Tracy and I returned to dine here twice in one week (hey, when you like something). On a Friday evening we were lucky to get the same server I had at lunch, Santos. He was personable and helped us (we dined with friends Tyler, Sayda, Karen ) navigate the rather large menu. But before I get to the food, let’s chat about the space. Situated on the corner of Altadena Drive and Washington Blvd. 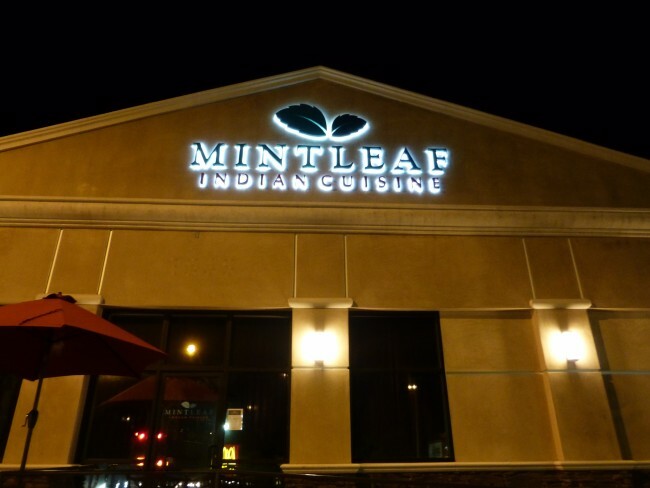 across from McDonald’s, the Mint Leaf is located inside an unassuming building in the parking lot surrounded by medical buildings. 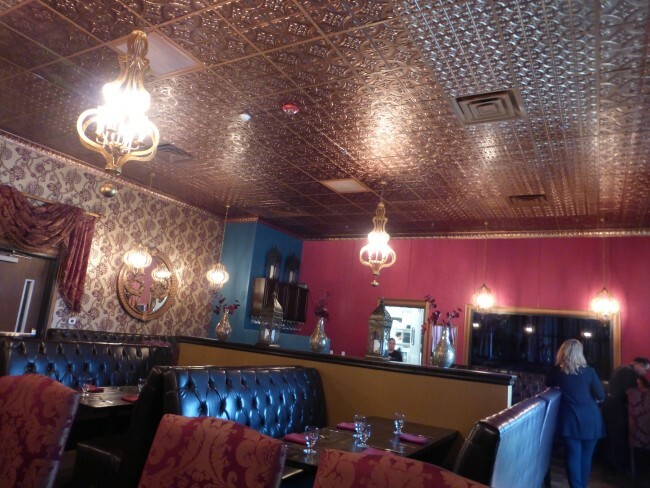 But don’t be fooled…teal colored walls, red drapes, a copper covered ceiling transported us to what I can only imagine (since I’ve never been there) is a restaurant found in India (without the McDonald’s across the street). On this Friday evening (and most others when we have visited) the restaurant was packed. In fact, we had to make reservations a week in advance. Despite the fullness of the restaurant, it was not noisy (photos below are not in order, as it is quite dark inside…most are mine, but a few I got off their website. With Santos’ help, Tyler selected something from each section of the menu for our party of six. We started with Achari Tandoori Mushrooms ($9); vegetable pakoras ($7); crispy cauliflower and potato fritters) and my new favorite corn malai tikkis ($8), savory cakes made from a dough of corn, mozzarella cheese, boiled potatoes and red onions). 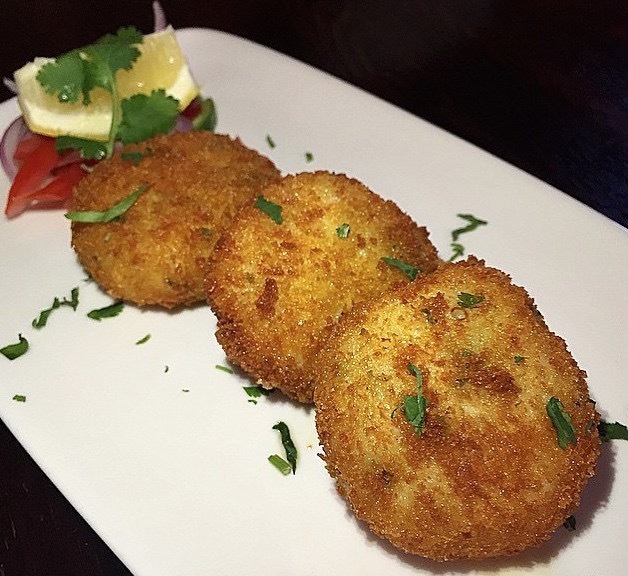 I could have dined just on the corn malai tikkis. Next up we ordered the very tasty Chicken Tikka Masala ($17.50), Tandoor-roasted chicken breast pieces in our classic and creamy tomato curry sauce), Kashmiri lamb curry ($17.50); lamb slowly simmered in light curry sauce made with fresh onions, ginger, garlic, tomatoes, cardamom and cinnamon) and Achari Tandoori salmon ($19.50). We enjoyed the chicken and lamb dishes the best. From the vegetarian section we tried the Aloo Gobi ($13.50); cauliflower and potatoes stir-fried with tomatoes, onions, ginger and Indian spices) and Tracy’s new favorite Dal Tadkewali ($12); a combination of dal of Indian moong (When the Moong hits your eye) and masoor lentils with chopped garlic, onions and tomatoes, flavored with cumin and fresh cilantro. An order of basmati rice ($4) and Garlic Naan ($5) rounded out our meal. This was plenty of food for our table of six. In fact, we were too full to order dessert. I hate it when that happens! We were so impressed with Mint Leaf we returned a few days later with our Supper Club friends (Andy & Leslie; Doug & Jackie). 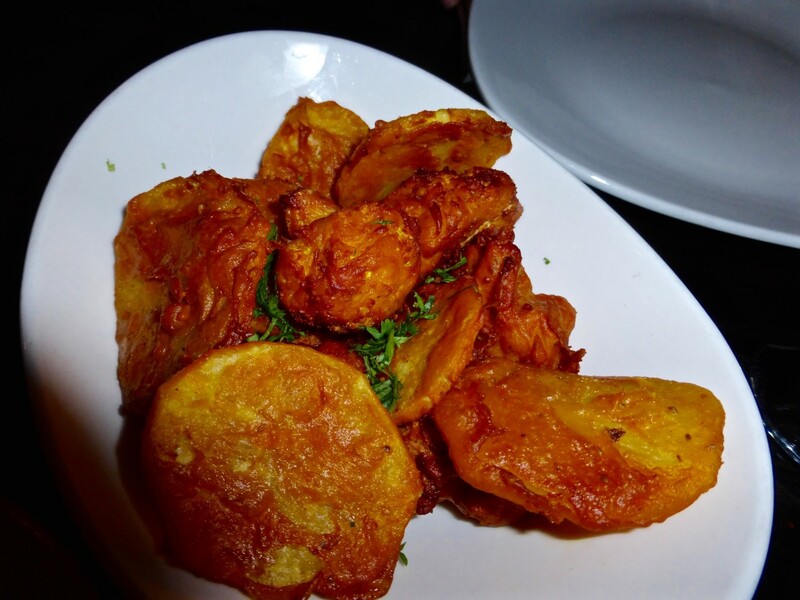 Once again we had Santos select the menu items for us. 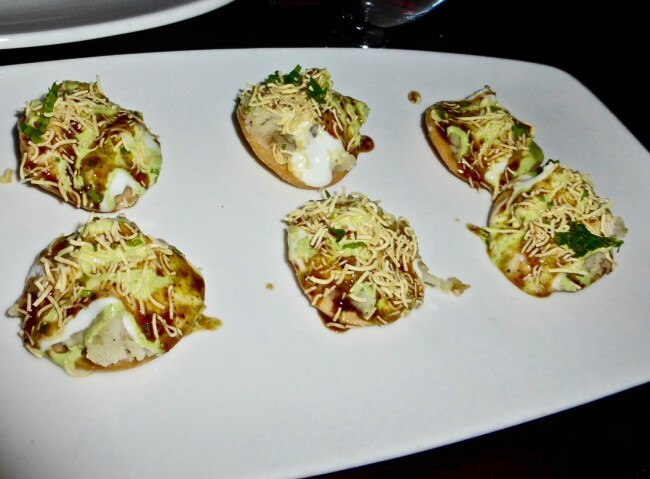 After inquiring as to any allergies (shellfish) and how much spice we liked, Santos selected dahi sev puri ($5; puff pastry shells with spiced potatoes topped with a mixture of chutneys and whipped yogurt), corn malai tikkis and potato walnut tikkis ($8) to start. Once again the corn malai tikkis were my favorite with a nice hint of heat in them. For our entrée we once again started with the Chicken Tikka Masala, which Santos informed us was actually invented in England (I looked it up when I got home…from wikipedia…“It was almost certainly invented in Britain and is among the country’s most popular dishes, leading a government minister, Robin Cook, to claim in 1991 that it was a national dish”). Never doubt Santos! 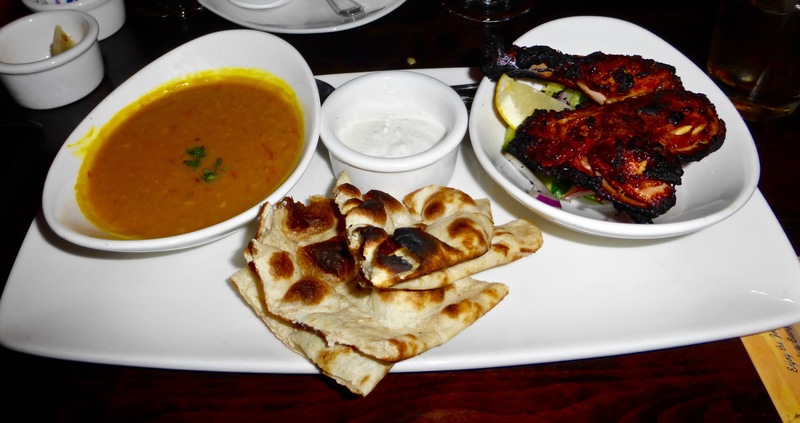 Since Andy was the spice impaired person at our table, Santos recommended the Tandoori Chicken for him ($16.50 half order) with a side of the vegetable raita, which Santos described as an Indian fire extinguisher. Jackie had the Kashmiri lamb curry, and for the vegetarians at the table we ordered the special Cauliflower Manchurian ($10); battered cauliflower stir-fried with ground chili, onions, ginger and a touch of soy sauce) and Dal Makhni ($12.50); whole black lentils with fresh tomatoes and a touch of cream). We ordered the garlic naan once again as well as the Basil and Mozzarella Cheese Naan ($4). Rounding out our order, a side of basmati rice and green pea pulao ($5; basmati rice with green peas, carom seeds and fried onions). Dessert was great, too. As we were leaving, Santos took me to the back to meet the chef who is a master at blending the subtle spices in all the dishes. 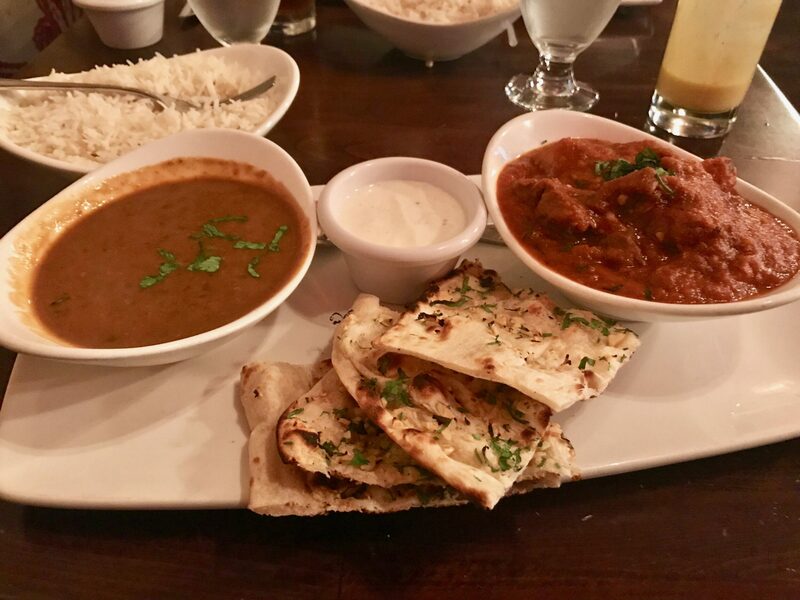 That’s as healthy and vegan as I get, so for my lunch I ordered Lamb Vindaloo ($14.95); Lamb marinated in traditional ground spices and malt vinegar blend, cooked in a fiery curry … with potatoes. 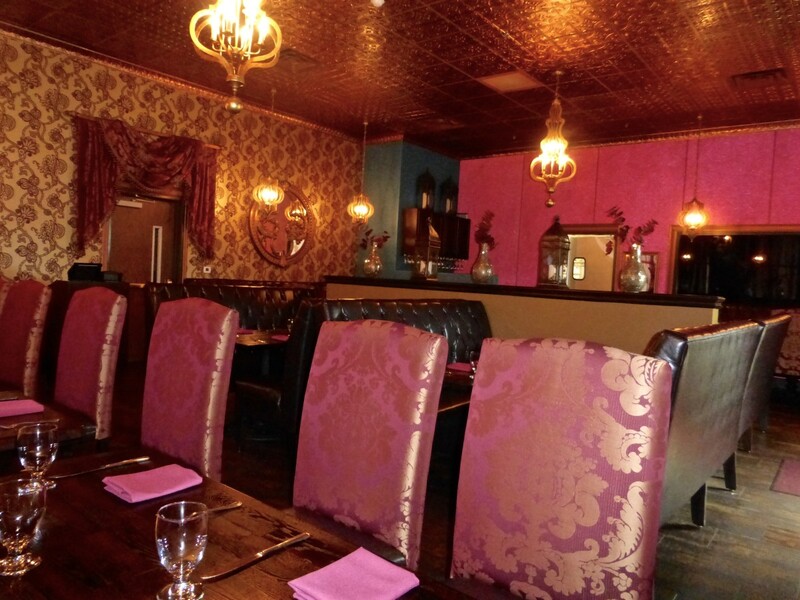 You can order your dishes at whatever heat level you like from 1 – 10 (ten being hottest). I love my hotness, so I went for an eight. I’m glad I had a a little of my Vegan Mango Lassi left. The dish definitely was hot … and delicious. 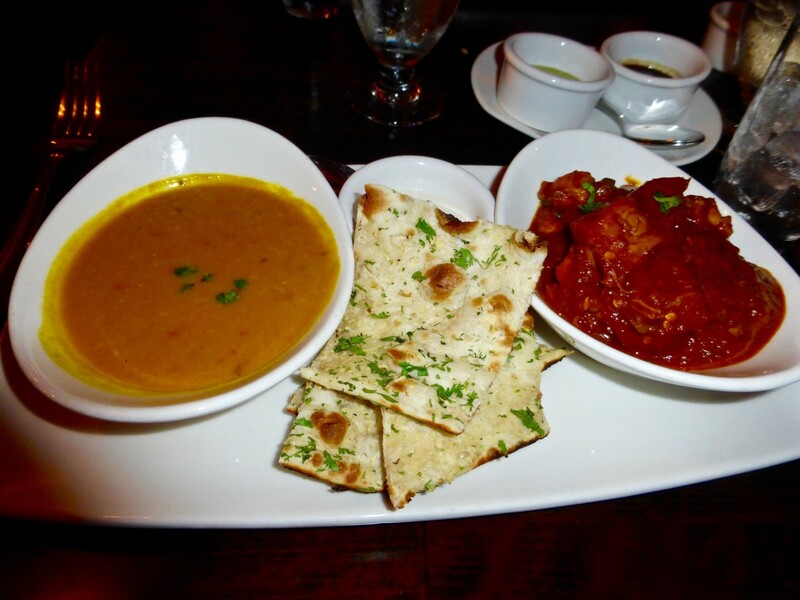 I also ordered some garlic naan and black lentils to go along with it. 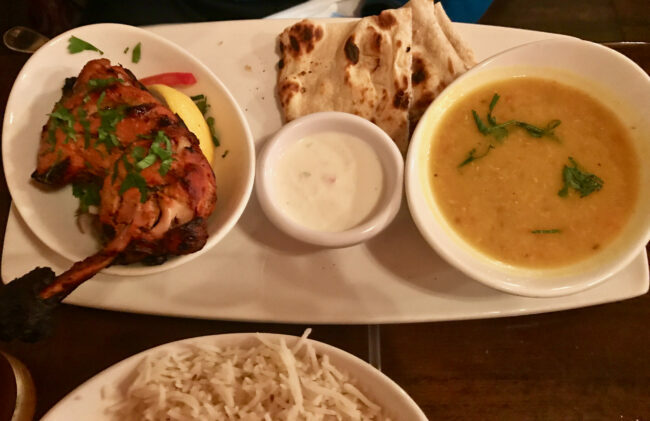 Ed goes a little lighter on the hotness scale (4), so he ordered his favorite Mint Leaf dish, the Tandoori Chicken ($14.95); a leg of chicken marinated with garlic, ginger and a special blend of spices, barbecued in Mint Leaf’s Tandoor oven. He also had yellow lentils and regular Naan. 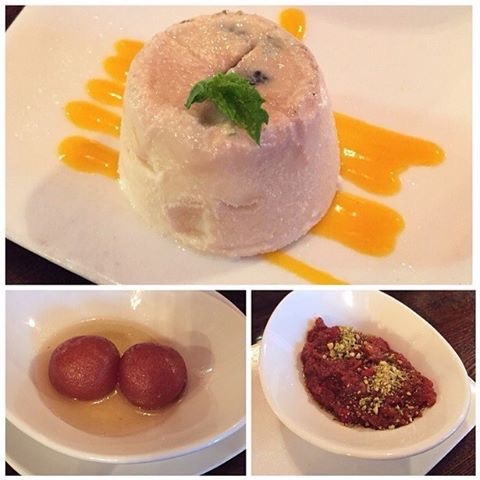 Mint Leaf is our “go-to” Indian restaurant, and we have enjoyed every visit (and there have been plenty). I think next time I’ll try a dish at the heat level of 9 (with two glasses of Vegan Mango Lassi by my side). Hours: Sunday – Thursday 11 a.m. – 2 p.m. & 5 p.m. – 9 p.m. Friday/Saturday until 10 p.m.